Miguel Ángel Zapata: Mario, with this beautiful view that you have here I could write a poem every day. 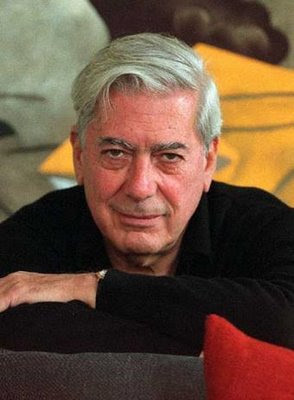 Mario Vargas Llosa: Yes, of course, but I couldn’t write a novel a day, although I can certainly progress a little bit every day in whatever novel I am working on. M. A. Z.: Then you would say quite definitely that the environment—one’s surroundings, nature itself—supports the process of writing and creating? M. V. LL. : Without a doubt. Yet I also believe that when you are obsessed with a story you write in the same mode regardless of your surroundings. change, because the sea in the morning is not the same as the sea at twilight, not the same as the sea when it is sunny or cloudy—is not only pleasing to me but also stimulating. M. A. Z.: You live in different countries. How are you able to continue working as you move around? that routine rigorously. I work during the week on the book I’m writing, and on the weekends I devote my time to writing articles; I write newspaper articles a couple of times a month. M. A. Z.: What is the point of departure for your writing? M. V. LL. : Generally speaking, the point of departure is memory; I believe all the stories I have written have been born of some lived experience that has remained in my memory and that becomes an image, fertile ground for imagining a whole structure around it. It’s also true that I have always followed an outline, almost since my first story: I take many notes, I make index cards, and I make some plot sketches before beginning to compose. In order to be able to begin writing I need at least a structure, though perhaps a very general one, for the story. And then I can begin to work. I first produce a draft, which is the part of the work that is hardest for me. As soon as I have it the work is much more pleasant; I can write more confidently, more securely, because I know that the story is there. This has been a constant in what I have written: doing research that will familiarize me with the theme, the situation, the period during which the story takes place. M. A. Z.: As is the case with your novel about Flora Tristán and Paul Gaugin. M. V. LL. : No doubt. Of course, that work dealt with historical personalities, but in other cases, although I’m not working with a historical situation, I anyway travel to the places where the story takes place, I read testimonies, newspapers of the period, not with the aim of reproducing a historical truth but rather to feel familiar with, immersed in, the environment in which I want to situate the characters and the story. Then I correct a lot, rewrite a lot. For me, to tell you the truth—this is something José Emilio Pacheco once said, and it seems right on the mark to me—what I like best is not writing but revising. It’s the absolute truth. When I correct and revise what I have already done, that is when I really enjoy writing the most. M. A. Z.: And when you finish a novel and it’s published, do you read it again? To look for faults, perhaps, I don’t know. . .
M. V. LL. : No. The last time that I read it is in proofs, and after that I try not to read it again, if I can help it. Sometimes when I work with a translator I am obligated to reread in order to correct errors, but in general I don’t like to revisit what I’ve already written and published. M. A. Z.: But perhaps you’ve read a fragment and thought that you would have liked to change a section of the novel, as was the case with Valéry, Juan Ramón Jimenez, and now with Pacheco, whose brilliant poetry is in a continual state of revision. M. V. LL. : Of course, that has happened to me often, and it is one of the reasons I don’t like to reread my own work once it’s published. Every time that I reread my own work I wonder whether I could have worked on the story a little bit more.